Hong Kong became a British colony as the result of a infamous event. To reduce a trade deficit, British merchants sold opium into China in the 1800s. When the Chinese government cracked down on this illicit trade, the Royal Navy defeated the Chinese in the Opium War and Hong Kong became a war booty in 1841. Ever since its founding, Hong kong has been a sanctuary of refugees from China during turmoils. My family fled from the Communists in 1949 and fortunately found shelter in my grandparents’ house. We had a very small space for the number of people, but it was a roof over our heads. it did not have flush toilet and night soil in our backyard outhouse had to be picked up by night soil workers every night. 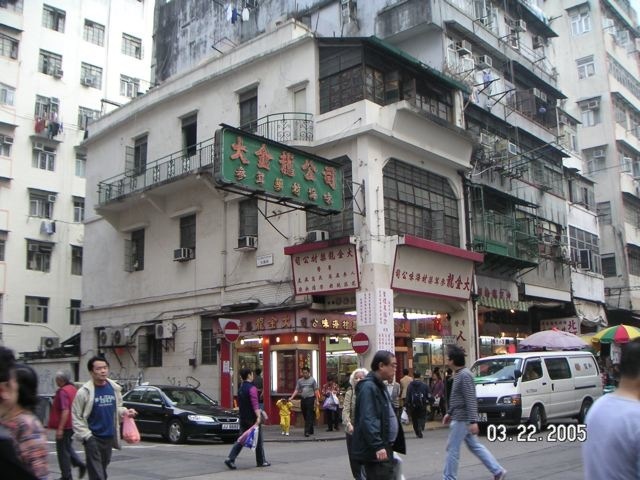 The house was a three story building similar to this rare relic in an old district of Kowloon. 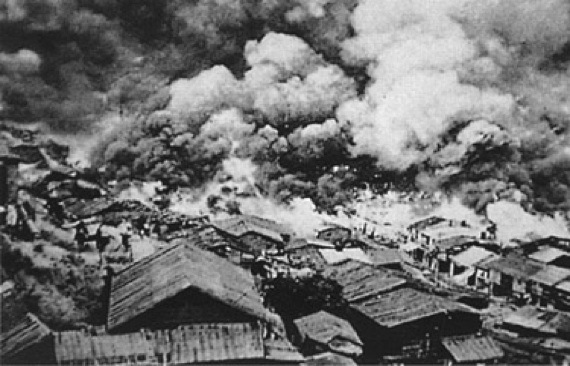 Occasional fires raged through these shanties and put tens of thousands of refugees into the streets. To their credit, the colonial government in 1953 started to design and build public housing to shelter the large number of refugee families. 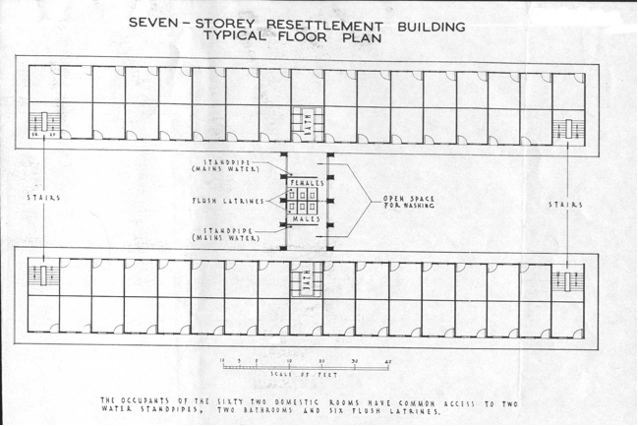 This floor plan is the first resettlement housing estates. Each living cubicle is about 10 ft by 11 ft, and everybody shared common kitchen and toilet facilities. After 50 years, most of these hastily built buildings deteriorated and became dangerous. These two were the last ones standing, and were torn down recently. 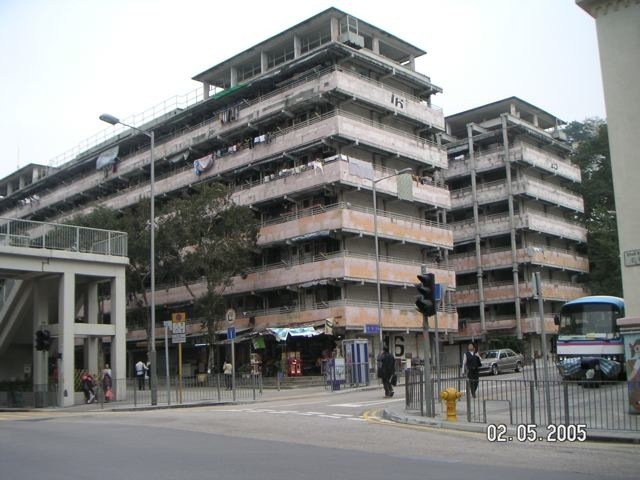 Their roofs served as school facilities for the children and many successful Hong Kongers were educated in such schools. Students attended classes on the shadeless roof, even during Hong Kong’s hostile hot summer days. 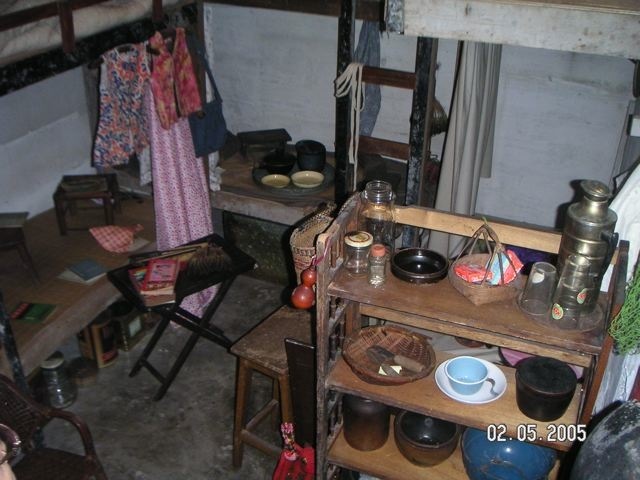 In an exhibition of the poor old days, a few living cubicles were set up to display the living condition of those residents. 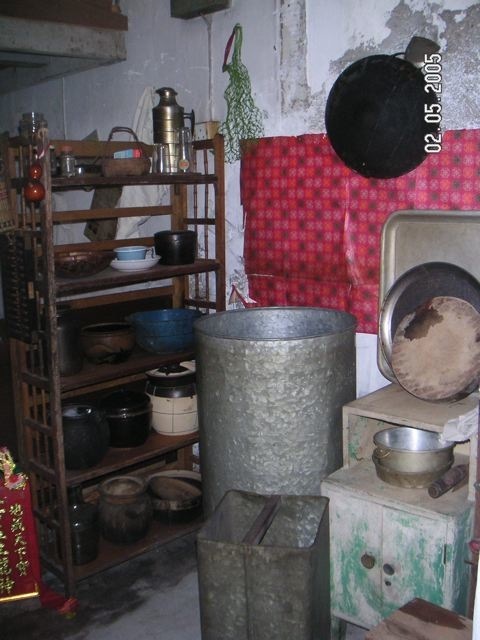 The walls were whitewashed, the floor was bare concrete, and a corner was set aside for cooking. A family of five was expected to live in one unit, but sometimes more than ten people were crammed into an 100 square feet space. A necessary item in each household were the water storage tanks. Since Hong Kong depended solely on rainwater to supply drinking water then, water distribution was strictly controlled. During one severe drought period, water supply was reduced to 4 hours every 4 days. Waiting in line to collect water to fill the water storage tanks became an obsession for Hong Kongers in those bad old days. Now, Hong Kong gets its unlimited drinking water from mainland China. 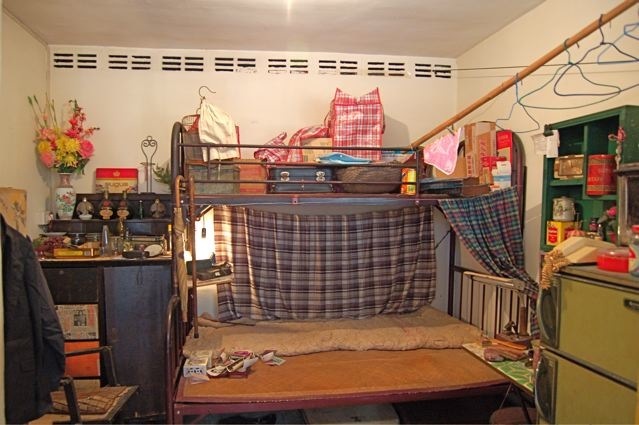 The remaining little space was devoted to various combinations of bunk beds and make shift sleeping arrangements. This unit apparently had only one or two fortunate occupants. 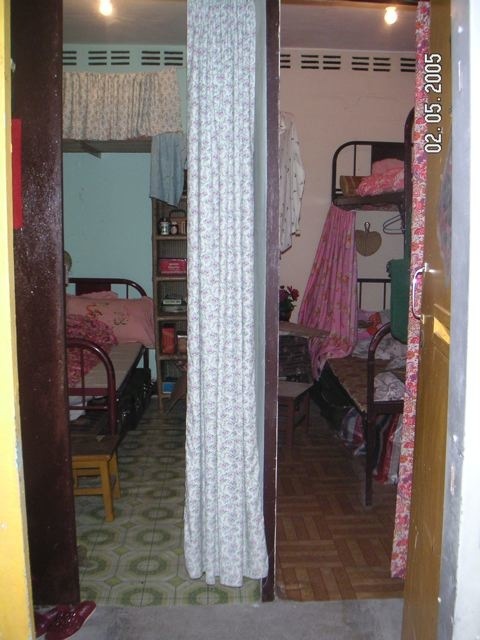 Another unit was shared by two families who partitioned the 10 feet wide unit into two 5-feet wide rooms. It makes one marvel at the adaptability of people when faced with adversity. 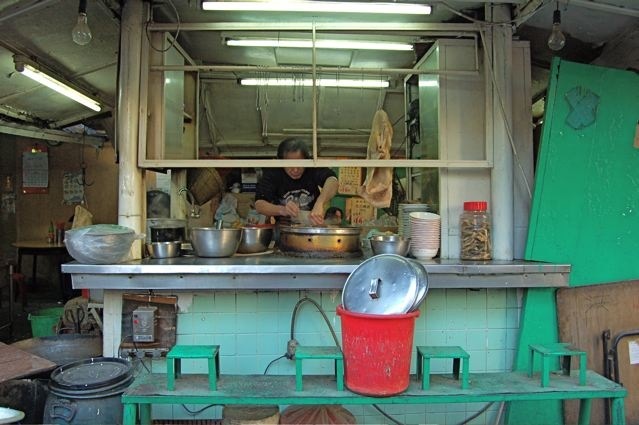 In the 1950s, many HK residents ate out at one of these street food stalls called daipaidong 大牌檔. They would climb onto the bench, half squat/half sit at the counter and watched the cook prepare their food. 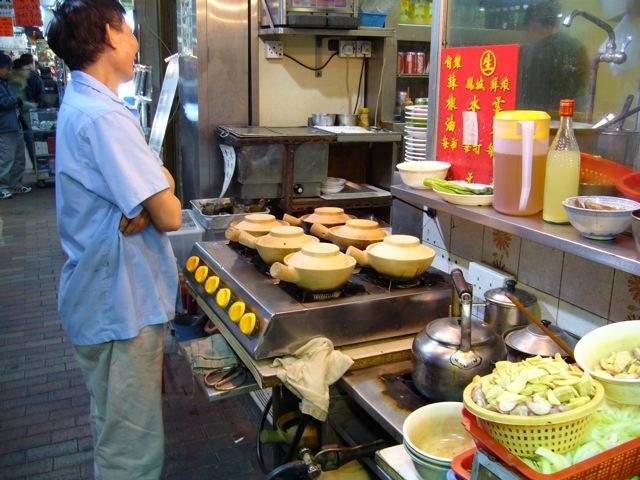 This is a rare daipaidong with the bench/stool setup still extant in Hong Kong. 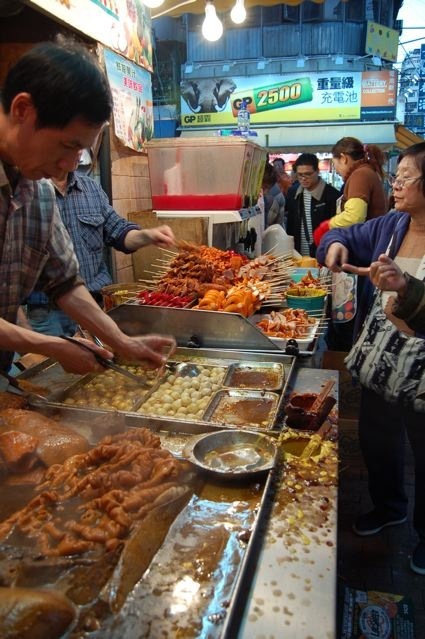 Street hawkers would sell snacks that included curry squid, fish balls, offal, toasts, preserved fruits, candies and cookies. They were often unsanitary, but they offered people some tasty breaks from the drudgery of life. When there was something to celebrate, people liked to eat in restaurants and might have ordered these rice dishes cooked with savory items in crock pots. Rice was the basic staple and rice stores offered many grades of rice. This old store has not changed in 50 years. I hope the items on the shelves have not passed their expiration dates. 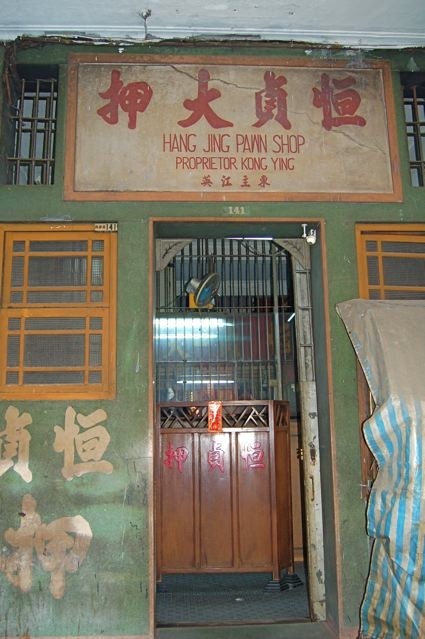 As life was hard, many people utilized the pawn shops to get through the day. Many would pawn their comforter in the hot summer and redeem it for the cold winter months. 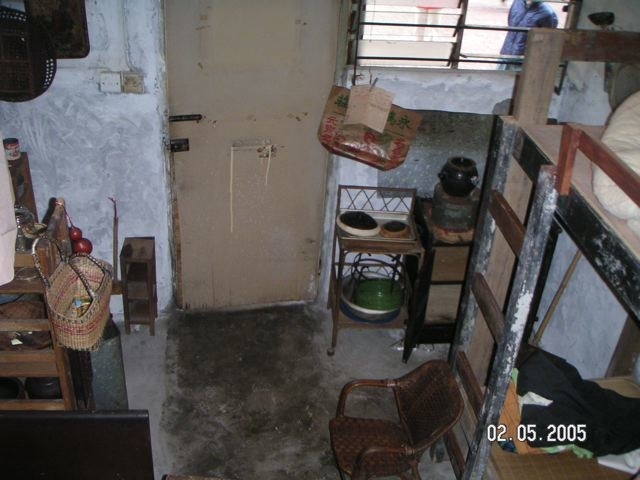 Today, fifty percent of the Hong Kong people still live in public housing with low rent. Along with an excellent health care system that costs very little to the residents, capitalistic Hong Kong provides universal benefits that socialist societies wish they could. This picture shows a modern public housing estates that are a far cry from the first resettlement estates. 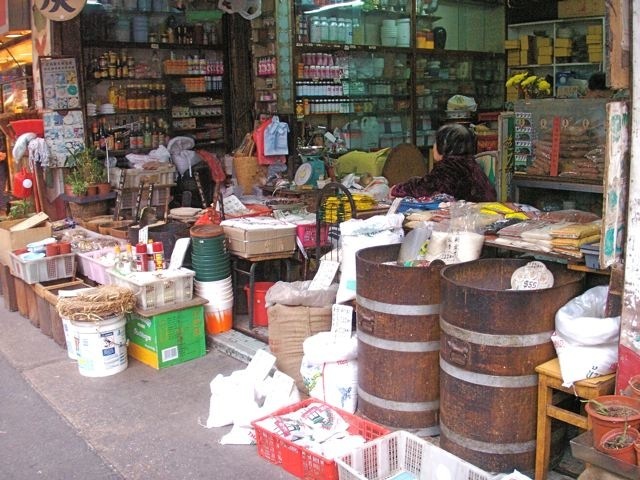 Hong Kongers were not deterred by poverty and hardship. They worked tirelessly, studied hard, were entrepreneurial and achieved an economic miracle. One main reason for their relentless work ethics is the lack of a social safety network. If they did not earn and save while they were young, they would look forward to certain poverty in old age. This is the power of Theory Z of management studies. 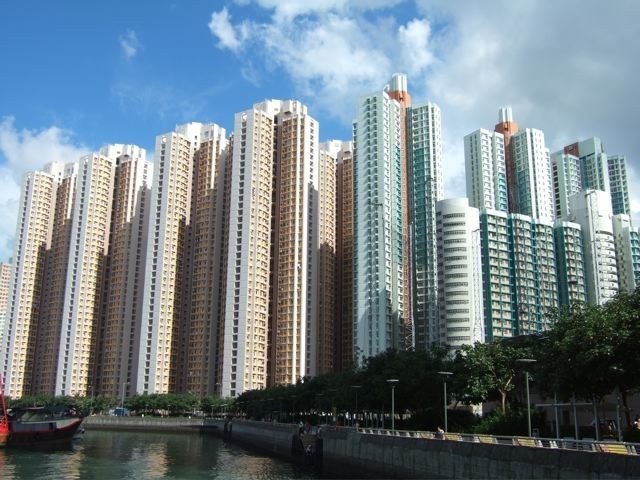 Today, Hong Kong has become one of the richest cities in the world, and has reverted its sovereignty to China in 1997. It was a strong propellant in assisting China’s aggressive growth in the last 30 years with infusion of capital, talents, international business experience, and its can-do spirit. This helped China develop into an economic powerhouse today. Posted by Robert Wu on Wednesday, December 31, 2008, at 8:43 pm. Filed under Uncategorized. Follow any responses to this post with its comments RSS feed. You can post a comment or trackback from your blog.